A vegetable garden without tomatoes? Impossible! Tomatoes are the most garden-grown vegetable in the world. Seed catalogs feature huge tomatoes on their covers. 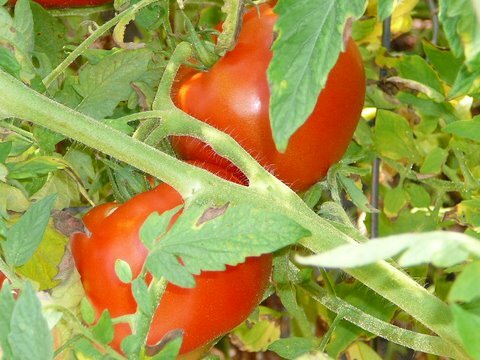 The mere thought of a fresh-cut tomato, just picked in your kitchen garden, starts your saliva flowing. Isn’t it time for tomato growers to recognize the world’s number-one veggie by adopting an official anthem or song? Anthems of great nations demand the attention and respect of their citizens. We stand in silence as we endure their renditions in solemn times, such as at the beginning of baseball, football, and basketball games. By contrast, the official anthem of the Tomato Patch demands an entirely different approach. It’s one that tempts you to sing along, smile, chuckle, tap your foot, snap your fingers, and move your hips and shoulders. It’s a song you won’t forget once the game begins. It’s a song you will sing all day long as you lovingly weed your growing tomato plants, pick their ripening fruit, or make a fresh tomato sandwich. It’s a song you’ll listen to again and again, a song of contentment and happiness. If you’re ready to enjoy the Official Anthem of the Tomato Patch—“Home Grown Tomatoes,” with Jay Unger and Molly Manor—CLICK BELOW. Didn't know you knew how to play the fiddle! Ab-so-lute-ly LOVE the “Home Grown Tomatoes” tune. Makes me think of my mom's Fried Green Tomatoes. Yum!